← Children’s Hour: Happy Birthday Winnie! Those of you who follow me on twitter might have noticed I’m been posting a lot of links recently. 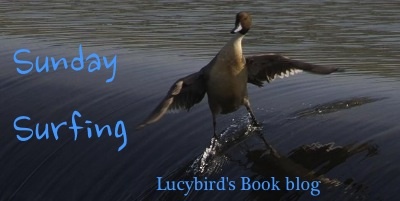 Sunday Surfing is my new-ish feature (inspired by Chrisbookarama‘s Friday Bookish Buzz, which is one of my favourite features) where I share my favourite links from during the week, about books and blogging. It’s the first day of December. How about some geek gifts for your friends. The Guardian first book award goes to Donal Ryan. Trainspotting is apparently Scotland’s favourite book. Bit of a rubbish sample though. Who in fiction are you? I came out as Scout from To Kill a Mockingbird. Win a years worth of books (UK only). I’m still stuck on one clue. Why don’t books for adults have illustrations? Famous novelists on symbolism in their books. I have a feeling I’ve posted this before…. And because I just got back from watching Catching Fire…. The kids read Happy Birthday Winnie! Now that NaNoWriMo is over I need to catch up on reviews. You can still sponsor me by the way, and my last update should be up later this evening.